We post a lot of trailers for Sandlot's ridiculous upcoming shooter Earth Defense Force 2025. We wouldn't bother so much, but D3 Publishers is really pushing for this game to be a success, each trailer more exciting that the last. I'm not sure how they can outdo this one, though. This extended 5 minute trailer should be the final selling point needed for anyone on the fence or still a stranger to the cult series. It's got a bit of everything: a dramatic countdown, suave narrator, fresh look at the cinematics and gameplay, and extensive footage of all the equipment and tools needed to save the Earth from the invading Ravagers. One point of interest I have are the laser guided missiles. 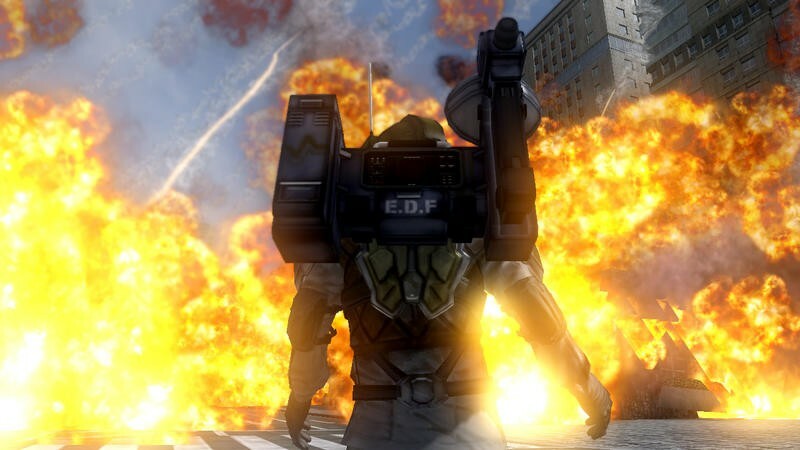 The previous game in the series, Earth Defense Force 2017, requires only a minimal amount of strategy in regards to weapon selection and reload time. However, a weapon like this requires more depth than is typical for the mindless series. With the addition of co-op to boot, it could be possible that working closely with a friend will open new layers of strategy when it comes to bringing down the giant foes. Does Earth Defense Force really need that extra layer of depth and strategy, or is it fine just being a mindless shooter? At any rate, the games sport a massive arsenal of weapons, each with with their own strengths and weaknesses. If depth and planning is not your thing, then I'm quite confident you'll find a weapon more suited towards you approach. Earth Defense Force 2025 is being released in Japan sometime this Spring. D3 Publishers has confirmed an American release, and the gaming award season already has an early front-runner. Look out world, Earth Defense Force is back!